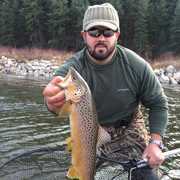 Hunting the Red River was awesome! Tons of wildlife throughout the hunt and killed a 300+ lb midnight black boar crossing the river at dusk. 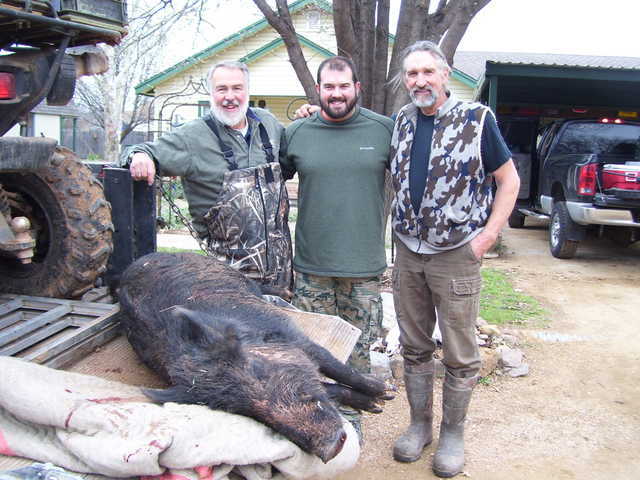 In talking to Jeff over the years he said that we had to come down for a hog hunt because "when they are in... they are in". Well as we kept in touch, a weekend opened up in early March of 2015 and it looked like the stage was set for a successful hunt. My dad and I loaded up the truck and hit the road. We left St. Louis.. and 9 hours later we were in Ryan, OK.
Jeff indicated that the best chances are at dusk, so we made it down in time to hunt Friday evening... and it did not disappoint. 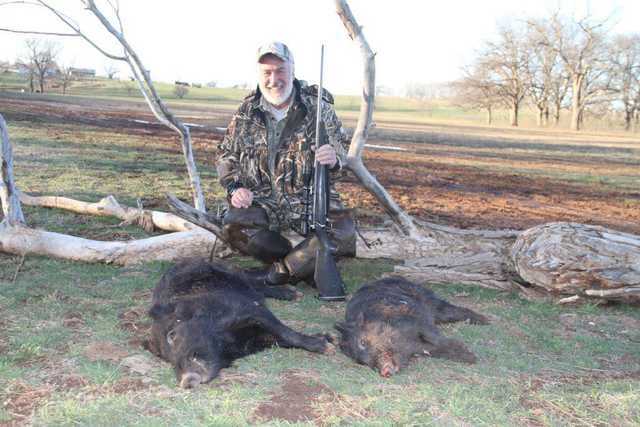 My dad ended up shooting a sow and a piglet right off the bat. The pigs "were in", and the trip was already worth the drive! Since we were only going to hunt the evening it created a different experience in regards to schedule. Getting to sleep in a little in the morning, after enjoying a few cold ones the night before, was a nice surprise! The next day I was hopeful that I would see something, and get a chance to pull the trigger. The night before I passed on a few coyotes that have been running the river chasing water fowl. Jeff had me in a great stand, right off the sandy banks of the Red River. This happens to be the Oklahoma/Texas boarder and the view was incredible. It was a stand that definitely afforded me the chance at a long range shot which I was hoping for. That Saturday night plenty of wildlife was around.. a couple groups of deer came in, along with some more coyotes and plenty of waterfowl. Jeff was adamant to stay in the stand as long as possible, so I was going to wait it out as long as I could. As the sun started to set I was glassing the banks and beaches hoping to catch a glimpse of this huge boar Jeff had on camera. I was nervous that my time might be up. Hoping to take a long shot I was set-up with my .338 Lapua and 8.5x25 Leupold optics, this meant I was losing light fast because I could only get down to 8.5 power. The sun faded below the horizon, the temp started dropping and it seemed like every animal around me was trying to settle in for the night. We knew the boar had been coming in late so I still had a chance, but started to think it just wasn't in the cards. Then I heard a bunch of splashing... I initially was thinking it was the ducks that had been making noise all day, but then realized there was a trotting pattern to the splash and realized he is coming. I thought.. "a hog from Texas was crossing the boarder and I was ready to help protect Oklahoma", but I couldn't see anything on the water yet. The river had gone dark, and then everything went silent. Worried that I had been spotted or smelled, I began to lose my mind. All I could think about was how close I had come to bagging this boar... and never even laid eyes on it. It seemed like time stood still - as I was flush with emotions. Then I heard one last splash and standing on the beach, the only place that still had light, was a 300+ lb midnight black boar. As I tried to get my scope on him he disappeared into the tall beach grass. At this point I figured I had about a 50/50 chance. He was coming into the feeder or gone. I now had two concerns, if I would see him again? and if I would be able to get a shot off before it was too dark? I could hear him walking very cautiously in the beach grass and all of a sudden I saw a head pop out less than 50 yards from the stand. He was standing on a dune and only his head was visible. I knew I would only get one shot... and I needed to make it count. Rolling through my head in this instant was.. "I'm sighted for 200 yards, cant see the body and there is hardly any light"... I better shoot hard and straight. Well I dropped the hammer just as this opportunity was about to expire, hoping that I had went down - and back far enough for a clean kill. After the muzzle break flash I couldn't see anything... but heard one loud squeal with this boars last breath. It was a great hunt and a great kill. Now I couldn't wait to put my eyes on him and see if this really was the big one Jeff had been catching on camera. I waited about 20 minutes just to be sure he was down, as the last thing I wanted was to spook a wounded boar in the dark. As I got my bearings under the moonlight... 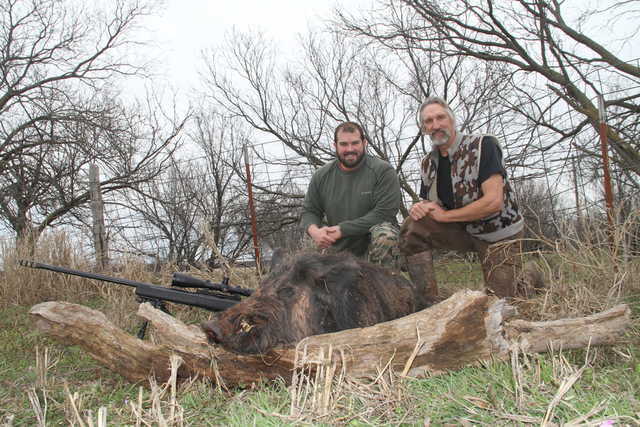 I found exactly what I had made the trip for... my first wild boar! I was beyond excited as I knew this was a lifetime memory. Anyone who hunts, knows that a plan rarely comes together from how you draw it up... but when it does, it becomes really special. Jeff had worked hard getting me in a high chance scenario, but in hunting that doesn't mean anything. Thrilled off the success, I figured there was only one thing left to do.. mess with Jeff! As Jeff got to the stand about 30 minutes later he immediately asked.. how'd you do? did you see anything? did you get one? Of course my answer was NO.. "I didn't see anything but some Cardinals.. I thought you said you were seeing some pigs around this area.. oh well maybe next year!" I sold it.. he had no idea about the hog, he hadn't heard my shot. In total disbelief I saw Jeff's head drop in disappointment... and then I said "I'm just screwing with you... I went ahead and popped that big boy you had been seeing on camera!" Jeff grabbed me.. gave me a shove.. and a look like you SOB... I knew you were messing with me! As we walked down the trail we found him, and Jeff confirmed this is the one! Jeff at that point was even more excited than I was! As we dragged and loaded him up, we couldn't stop talking about the hunt. It was a hunt I will always remember... and couldn't have been happier with the results. If you want a great hunt with great people look no further then Jeff! He is a great person who knows what he is doing, but more importantly cares. 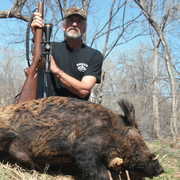 Jeff will do everything he can to put a client on hogs, deer, coyotes or what ever you might be hunting. It is an experience you wont forget with someone you can trust. Shoot hard.. Shoot straight.. and bring a big caliber because those hogs are tough and much bigger than the look!